Dilated cardiomyopathy is a disease characterized by an increase in ventricular volume (mainly of the left ventricle) associated with wall thinning and deterioration of systolic function. It is one of the main causes of severe heart failure and heart transplantation, and it presents a high risk of cardiac sudden death. 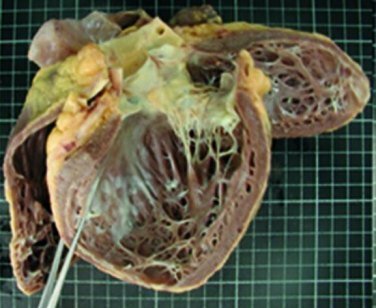 It can identify the causing mutation, which confirms the diagnosis of the disease and constitutes an important tool for differential diagnosis, since its presentation frequently overlaps with other cardiomyopathies. Not all mutations in different genes show a similar behavior: they are usually associated with a specific set of symptoms and with a different prognosis (for example LMNA mutations). This helps performing the appropriate risk stratification for the disease and foreseeing possible complications. By detecting a pathogenic mutation, the test can be used with a predictive value, constituting the cornerstone of genetic counselling. It is a cost-effective strategy for family monitoring, since it allows detecting carriers at risk who must follow the appropriate clinical monitoring (given that they are highly likely to develop the disease in the future). Contrarily, non-carriers present the same risk as the general population. The probability of detecting a causative mutation in a patient under suspicion of familial dilated cardiomyopathy is close to 50%. In any event, diagnostic yield depends on multiple variables such as number of relatives affected, clinical suspicion, age, race, origin, etc. This panel is indicated as a first diagnostic approach upon clinical suspicion of familial or idiopathic DCM. This is the most complete panel on the market for this pathology, including genes that can also be associated with cardiac conduction diseases and/or muscle alterations, both in clinical and subclinical phase. It includes priority genes recommended in clinical practice guidelines and clearly associated with this disease. Sporadically associated secondary genes are also included, along with candidate genes gathered from a systematic literature review.